Tien Thuy Ho is a Ph.D. in Education student with a specialization in Language, Literacy, and Technology (LLT). She received her bachelor’s degree in English and Economics from the University of California, Los Angeles and her master’s degree in Education, Culture, and Society from the University of California, Riverside. Tien’s path towards studying education was paved by her childhood experiences as an English language learner who struggled to find her place in the classroom, and by her work as a tutor for middle school students at a learning center located at the heart of the Vietnamese community in Southern California. Tien’s research interests include writing, reading, and vocabulary development of elementary school and adolescent students. 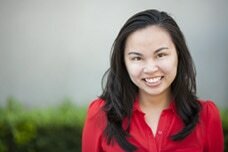 Furthermore, Tien is passionate about the academic and identity challenges of immigrant and language minority students.